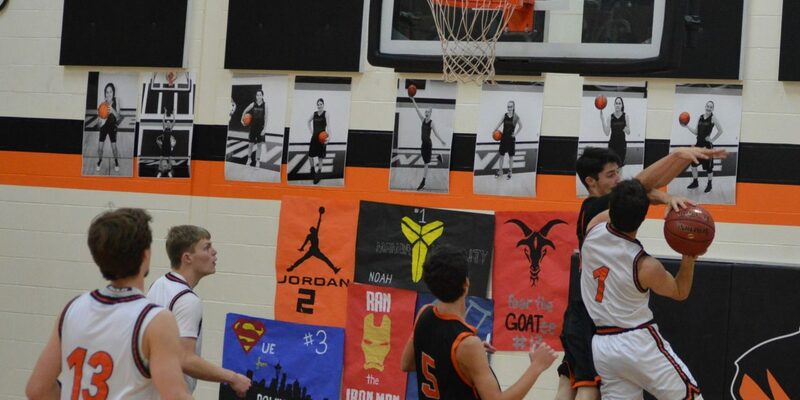 Here is the complete coverage of the District 4 2B Boys Basketball Tournament. The latest game results, stories and pics will appear at the top of the page and be updated after every round through the run of the tournament. 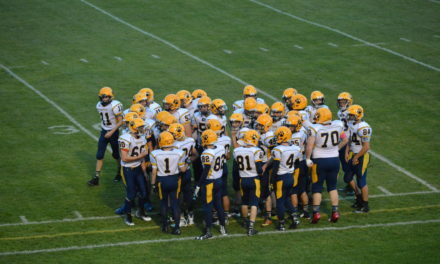 For more on this game read Matt Baide’s story on the Lewis County Sports Blog. The T-Wolves ran past LC for the 20 point win and now will play Tuesday in the District Semi-Finals against Adna at Kelso at 6p. LC will play Monday in a loser out against Raymond at Montesano at 7:30. For more on this game check out the story in the Lewis County Sports Blog. The Ducks surprised the Indians not only with the win but how they won. 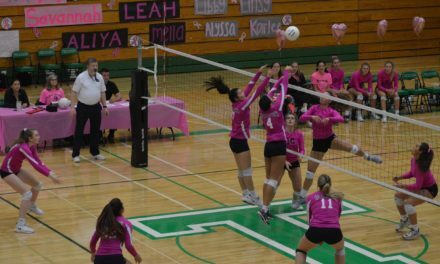 Toledo stumbled badly and now will have to play Monday in a loser out game against Chief Leschi at 7:30 at Rochester. TL moves on to the Semi’s Tuesday against Napavine at 6p in Kelso. For more on this game check out the story in the Lewis County Sports Blog. The Pirates rolled over the Cards and move on to the Semi-Finals Tuesday in Kelso and will play MWP at 7:30. 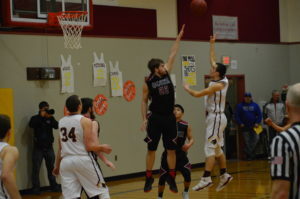 Winlock plays Monday at Centralia against Ilwaco with a 7:30 start time in a loser out game. The Tigers survived and advance to the Semi-Finals on Tuesday against Toutle Lake in Kelso at 6p. The Vikings play Monday in a loser out game against North Beach at WF West with a 7:30 tip-off. For more on this game check out the story in the Lewis County Sports Blog. The Ducks got the hard fought win and now move on in the winner’s bracket to face #1 seed Toledo on Saturday, time and location still to be determined. Ilwaco falls into the consolation bracket and will play on Monday the loser of Saturday’s Adna vs Winlock game in a loser out contest. 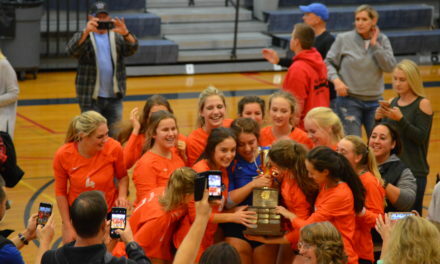 For more on this story check out the Prep Round-Up in the Daily News. 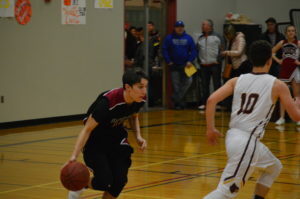 The Tigers rolled in the District opener and now will be tested on Saturday when they face 2-seed Willapa Valley, time and location to be determined. Raymond faces a loser out game on Monday against the loser of Saturday’s game between Morton-White Pass vs Life Christian game. 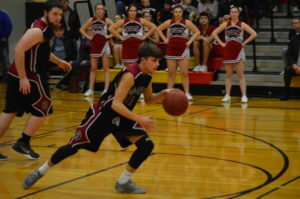 (Rochester, WA) The Cardinals 2-2-1 zone press flustered the Warriors early and a determined climb back by Chief Leschi fell short at Rochester High School’s gym. Sixth-seeded Winlock (14-8) faces a challenging second round game Saturday night against second-seeded Adna, which beat the Cardinals, 75-45, back on January 17. Chief Leschi (14-7), a #3 seed, will play a loser out game on Monday against the loser of Saturday’s Toledo vs. Toutle Lake game. 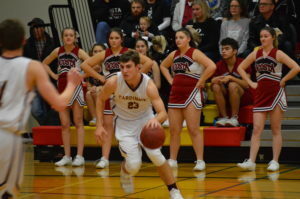 With 5-foot-6 sophomore guard Carter Whitehead leading the way with outside shooting and offensive rebounding smarts, the Cardinals converted turnovers off their press into points, flustering Warriors’ shooters early. 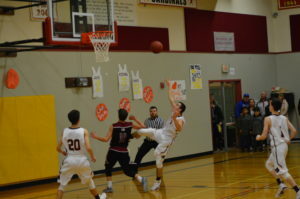 Early in the second quarter, Winlock led 22-8 after Whitehead, who would finish with a team-high 17 points, nailed a three-pointer from the top. 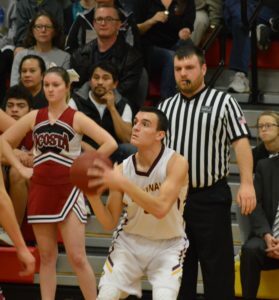 But Chief Leschi, sparked by three baskets from Chris Whitford, went on an 10-2 run to get back into the game. Whitford led the game in scoring with 18 points. Back-to-back threes by Khyree McQueen and Kahea Baker to close the half, cut Winlock’s lead to 28-24 at intermission. The Warriors came within two twice in the third quarter on Whitford scores but could never get over the hump. 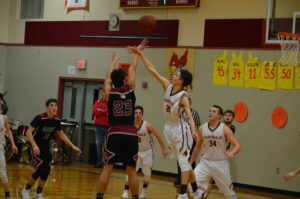 Bryce Cline, who had erupted for 29 points in Winlock’s play-in game victory over Ocosta on Monday, was quiet early in this one but ran off seven crucial points in the third on his way to 12 total points as the Cardinals began to pull away. Nicholas Patching also reached double figures for the winners with 15. Donnelle Irvin had 13 for Chief Leschi. Whitford was named Pacific Sports Spas Player of the Game for Leschi while Whitehead got the honor for Our Thorebeckes Sportsmanship of the Game award went to Coleson Richendollar of Winlock, who made several key defensive plays as well as interacting positively with his opponents. It’s a cliché, but if this game was a boxing match, it would have been stopped early. 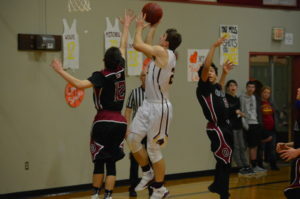 Morton-White Pass, a fourth seed, scored the first 20 points of the game and led 28-2 after a quarter without giving up a field goal to the fifth-seeded Hyacks. Central Washington-bound wing Matt Poquette scored 12 of his game high 19 points in the first half, including an alley-oop dunk, and the Timberwolves (17-4) led 44-16 at intermission. But North Beach (8-14) got back-to-back threes from Nolan Charley to start the second half and played hard enough to avoid what seemed certain at the start — a running clock near the end of the game. Morton-White Pass meets a number one seed, Life Christian, whose players were on hand to scout the game, Saturday. North Beach will play either Napavine or Willapa Valley in a loser-out game on Monday. The Timberwolves led by as many as 33 during the third quarter when Kaleb Rashoff’s three gave them a 62-29 lead but the Hyacks, who saw Steven Sotomish score all but four of his team-high 17 points during the second half, never let them grab a 40-point edge. 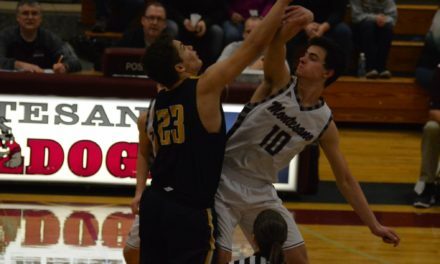 In addition to Poquette’s 19, Morton-White Pass post Tristan Storey reached double figures with 18 and Rashoff had 11 as nine different players reached the scoring column. Sotomish was the lone Hyack in double figures; Ben Poplin back him up with seven. 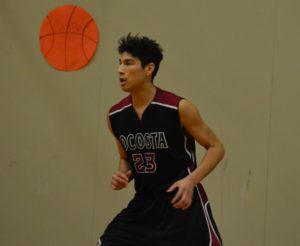 Poquette, who added rebounding, shot-blocking and several steals to his scoring, was named Pacific Sports Spas Player of the Game for the Timberwolves and Sotomish for the Hyacks. Our Thorebeckes Sportsmanship of the Game award went to Isaac Salguero of Morton-White Pass. The Ducks had little trouble getting through the loser out contest with the Mounties. 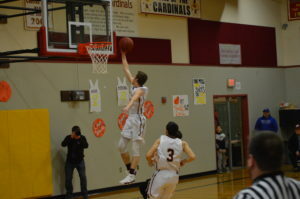 Toutle Lake will next play Ilwaco on Wednesday night at 6pm at WF West High School. For more on this game check out the Prep Round-up in the Daily News. The Gulls advanced to Districts with a solid performance through all 4 quarters. Raymond now faces Napavine on Wednesday night at WF West High School with a 7:30 tip-off. For more on this game check out the Prep Round-up in the Daily News. 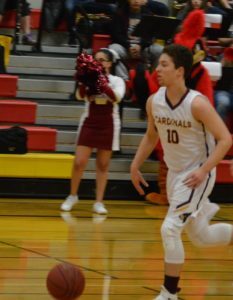 (Winlock, WA) The Winlock Cardinals head coach Nick Bamer wanted his team to get off to a fast start and starting Point Guard Bryce Cline took it to heart scoring 5 points in just 25 seconds and the Cards never looked back. Bamer’s high rotation kept the Wildcats off guard as they ran off to a huge 1st quarter lead finishing with 29 and leading 29-13. The Wildcats would make a couple runs in the game including in the 2nd quarter and get back close to single digits thanks to 17 points off the bench from Richard Dueber but the Cards had an answer each time. Nicholas Patching would lead the 2nd Cardinal surge with a 3 at the buzzer in the 1st quarter and 8 more points in the 2nd to push the halftime lead to 44-33. After getting as close as 9 in the 3rd quarter, Cline would hit a 2 to push it back to double digits and they would go on a huge run with Dawson Hall taking over in the 4th scoring 10 points. Cline would finish with 29 points. The lead would get pushed back to 17 with just 2 minutes to play when both teams emptied their benches to finish the game. 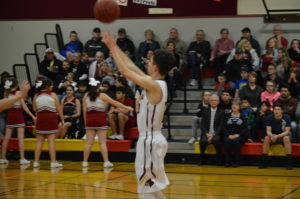 Winlock improved to 13-8 overall and will move on to play Chief Leschi on Wednesday at 6p at Rochester while Ocosta had their season come to an end. Our Pacific Sports Spa Players of the Game went to Winlock’s Bryce Cline and Ocosta’s Richard Dueber. Our Thorebeckes Sportsmanship of the Game award went to Nicholas Patching. The Hyaks rolled over the Mules and advance to the District Tournament. North Beach will now play Mprton-White Pass Wednesday night at 7:30 at Rochester. For more on this game check out the Prep Round-up in the Daily News.